We also want your funny, heartwarming and/or upsetting Northern Quarter stories, and suggestions for the most iconic places in the 'hood as well as lesser-known gems to try and capture on audio. Bring it on. Share your two pence worth here in the comments or email me at themanchizzle at gmail dot com. The Northern Quarter. Does that include Collyhurst? Plus I think some additional rebranding could be in order judging by that picture. How about New Whitechapel c 1888. 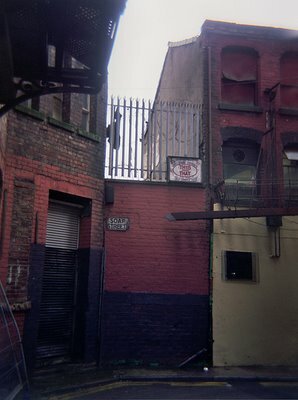 Yeah backroads, i think this picture really capures the Northern Quarter's appeal. If this is post-gentrification, what was it like before? Good luck with the project and let us know how it goes. Ooh, our favourite place in the Northern Quarter is the Richard Goodall Gallery. It's the only gig poster/rock photography gallery in Europe and he's responsible for commissioning gig posters for the Manchester Academy venues amongst others. The graphic design and artistry in a lot of this stuff is fantastic. Yeah, that's a great gallery - thanks justhipper. Have you guys recovered from ITC? I don't think recovery is possible until after Xmas at this point ;). We, sadly, didn't get to see as much at ITC as we wanted cause I was ill. There should be a review up in the next day or so of what we did see though. Nephew, as always, were fantasic. Did you get to anything good? justhipper, I didn't take in a single gig, apart from walking hurriedly through the night and day to meet someone. There's always next year. Roy: sounds very promising. Get in touch when you're back in blighty. Sadly the landlady of the Castle just died. She would doubtless have had some good stories. Perhaps also the clientele of the Hare and Hounds - there are some there who look as if they've been around for decades.